The world’s most underwhelming pulse. Universally cooked to near oblivion and ridiculed as sub-standard hippy/student fare, the humble lentil has a bad reputation, but cook them so that there’s still a tiny bite to them, and then hit them with a pile of spices and it’s a different story. If any food is a blank canvas, it’s the lentil. This dhal is a massive jolt of flavour, and it shows just how good the humble lentil can be. The recipe is in two halves – cooking the lentils and preparing the spices – both of which you can do at once. Cooking lentils takes time, and it’s important that you do it properly, because improperly cooked lentils could make you ill.
Wash 250g of yellow toor lentils or chana dhal, cover with plenty of cold water, add a whole tomato and two halved cloves of garlic and bring to the boil. Toor lentils and chana dhal don’t need soaking, but check the packet and cook them as directed. 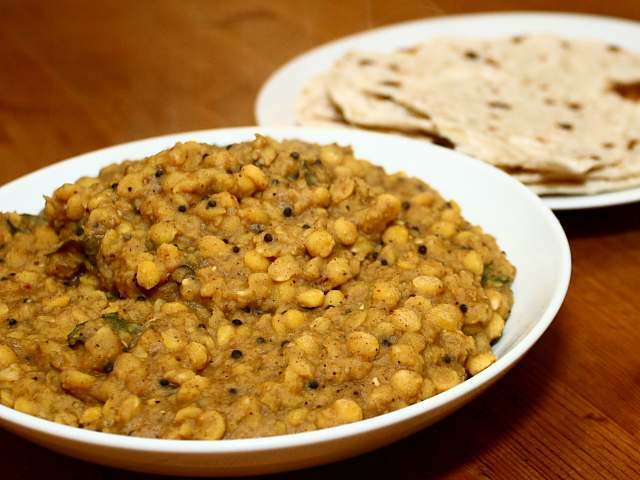 Toor lentils should take about half an hour, chana dhal maybe another ten minutes longer. When the lentils come to the boil, you’ll need to skim them. There will be a fair amount of foam that needs to be scooped up and chucked away. It’s a very satisfying job. While the lentils are cooking, get the spices ready. Toasting spices releases a whole new dimension, and it’s worth getting it right. Remember that you’re dealing with lentils that don’t taste of a great deal, so getting the spicing right is fundamental to the success of the dish. Spices toast at different rates. Heat a dry, heavy frying pan over a medium heat and start with three tablespoons of coriander seeds. Toast them until they’re quite dark, then tip them into a bowl to cool. Do the same with two tablespoons of cumin seeds. Fennel and fenugreek seeds don’t need to be toasted so much, so separately toast a tablespoon of fennel seeds and a teaspoon of fenugreek seeds until they’re only lightly browned. Add them to the rest of the toasted spices, and add a three centimetre stick of cinnamon, the seeds from ten green cardamom pods, a long dried red chilli and a teaspoon of black peppercorns, and then blend the lot to a fine powder in a coffee grinder or pestle and mortar. This spice mix is enough for a few batches of lentils, so store what’s left in an airtight jar, or double up on the lentils and have a couple of decent lunches next week. After thirty or forty minutes, the lentils should be soft and creamy, but you might need to tip away some of the liquid to get the right consistency. The ‘right consistency’ is a matter of personal taste, so go with what feels right. ‘Slightly wet’ is a good point to aim for. Add a teaspoon and a bit of salt and a generous teaspoon of the spice mixture. Taste, and adjust both. You’ll definitely need more spice, but be careful of the salt. Before serving, there’s one final flourish. Heat a good glug of a neutral oil in a frying pan and throw in a teaspoon of black mustard seeds and another dried red chilli. As soon as the mustard seeds pop, tip the lot into the lentils along with a handful of fresh curry leaves, dried if you can’t. Stir everything together and eat with chapatis. Must admit to being a fan of the lentil – as you say really good in curries, and also good with pasta and other stuff. A can of those nice puy lentils is always good to have in the cupboard. On your blank canvas you have created a masterpiece of spicing. Lentils can be really dull if not given the proper treatment but I would happily tuck into a bowlful of these. I love the mustard seed/chili dressing to add that final blast of flavour. Tasty lentils? Yes, indeed! I love lentils! Cooked properly they are awesome!!! I have to try your recipe. So clever and right on with the "blank canvas". Lentils can be tasty, but spices can make them perfect. Lovely site, thanks! Made it with the red lentils and with yellow mustard seeds (didn't have black), less cumin (ran out) and no curry leaves and it was delicious. Chucked in some spinach at the end too, good times. Whhooooaaa…steady on there! Yellow mustard seeds? That's a bit cavalier, isn't it? I truly do love legumes in all their guises. I watched Paul Merton in Europe recently. The episode in Italy where he attended the society for the preservation of the green lentil, with initiation ceremonies, cloaks and all, was quite something to behold. Apparently you get fanaticism for everything! yes, lentils are fantastic, and you have JUST proved it!